Rio Grande is the frontier of discord, between Mexico and the USA. In its course, pass hundreds of illegal Mexican immigrants. Rio Grande is known to Mexicans as Rio Bravo or Rio Bravo del Norte. It springs from the San Juan Mountains, in southwestern Colorado in the U.S., heads to San Luis Valley, then south through New Mexico and the state of Texas to form the border between the U.S. and Mexico. Rio Grande runs into the Gulf of Mexico near the Texas town of Brownsville. The length of the Rio Grande reaches 3034 km, making it the fourth or fifth longest in the U.S. and third largest river in North America, aftr Mississippi river and Missouri river, Columbia river and Yukon river. Its water flow is estimated at 472, 000 sq. km. The main tributary of the Rio Grande River is Rio Conchos, who joins in Ojinaga, in Chihuahua, in El Paso. Other better-known tributaries of the Rio Grande and Pecos are smaller Devils, which flow into the river at Amistad Dam. With its flow, the Rio Grande passes through alpine areas. such as El Paso, which reaches 1147 m altitude. In West Texas Rio Grande makes a sharp turn to the northeast, forming the place known for its wondrous beauty, known as Big Bend. This is probably the most diverse in terms of flora and fauna location along the river. This canyon was formed with vertical walls, galloping water rapids, and many believe that this is one of the most pristine natural places in the Rio Grande. It is one of a total of two protected areas upriver. It is known as Big Bend National Park, and the other reserve is within the northern New Mexico. 800, 000 hectares of agricultural land is irrigated along the Rio Grande - in which it includes more than half the territory of Mexico. Like most big rivers in the world, Rio Grande suffers from environmental pollution. In the summer of 2001 at the mouth of the river was formed a giant 100-foot sandbar, resulting in water not draining into the Gulf of Mexico. After several drainage attempts with sand accumulation, were repeated until the autumn of 2003 the Rio Grande again reaches the ocean. According to a recent survey, the Rio Grande is one of the rivers in the world who are most at risk of gradual extinction. 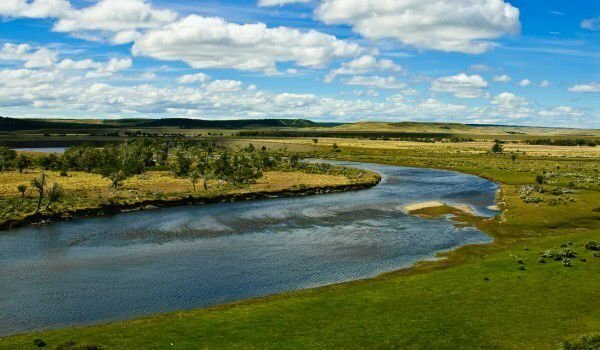 Furthermore, like the Rio Grande, in danger of drying are La Plata River, the Nile in Africa, Darling river in Australia. The remaining five are in Asia, including the Ganges and Indus, and Europe threatened is Danube. Results are from a study of the international conservation organization World Wildlife Fund (World Wide Fund for Nature). The reasons for the possible drainage of the Rio Grande and other rivers worldwide are rooted in serious environmental pollution, construction of dams and related human activity creating climate anomalies, including global warming.